Real buttermilk, a great by-product of making Homemade Butter makes all the difference in this recipe. 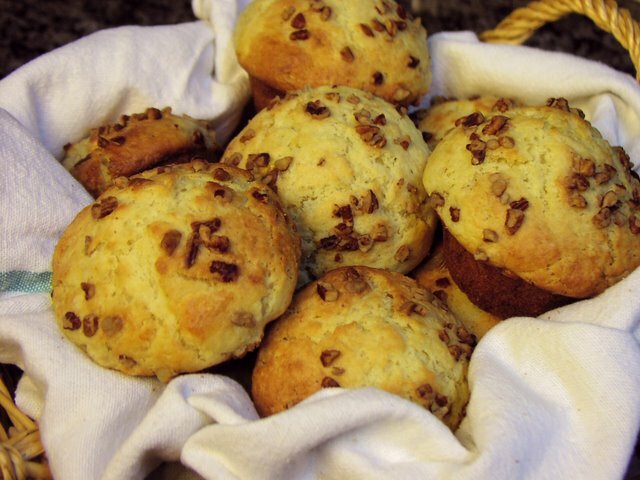 When I first started making muffins, I had to go to several cookbooks to find a good base recipe for muffins, and finally found one in the America’s Test Kitchen Family Cookbook. After making butter this week, I had just enough buttermilk to substitute for the yogurt I usually use, and just enough bananas in my freezer to make a batch of muffins. What a difference it made. The buttermilk gave the muffins a really nice even crumb, and they were even lighter than usual. My boyfriend actually begged me to take some to work so he wouldn’t be tempted to eat them all. If you don’t have real buttermilk, you can substitute cultured buttermilk, yogurt or milk. If you use milk, stir in 1 Tbsp. of lemon juice and let it sit for 10 minutes until it starts to thicken. For best results use whole products, not lowfat or non-fat. Preheat oven to 375 degrees F. Prepare a large muffin pan by spraying with cooking spray or greasing with butter. In a large bowl, combine the flour, sugar, baking powder, baking soda, salt, and nutmeg. Whisk until well combined. In a separate bowl or large measuring cup, whisk together the buttermilk and eggs. Form a well in the center of the flour mixture, pour in the buttermilk mixture and fold until most of the dry ingredients are absorbed. Do not overmix. Gently fold in the melted butter, then the bananas. Using a large ice cream scoop, divide the batter evenly in the muffin pan. I like to press a few chopped pecans into the top of each muffin to add a little toasty crunch. Bake 25-30 minutes until golden brown. Cool 5 minutes, then remove the muffins from the pan and cool on a wire rack. I’m not even big on banana and I think I could eat that whole basket. There’s just something about buttermilk in bread!